This little guy was given to my oldest daughter at a safety workshop. His two-fold mission is to exhort Hong Kongers to attain the laudable goal of 'zero traffic accidents' - and to act as a handy paper holder of course. What makes him truly odd, apart from his car/hat, is the matching set of 'wheels' on the back of his head. 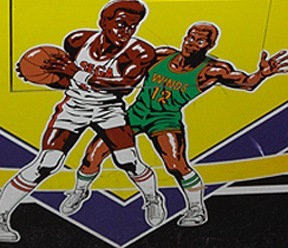 Initially I thought this was a bizarre attempt to complete the car motif; then it occured to me that this was in fact a second set of eyes, strategically placed to assist him in his mission. I also like his wrap-around toga/belt, constructed of a green swath of accident free highway; note that it also covers his spirit genitalia - modesty and traffic safety, stylishly combined. This is a pair of socks for sale in the Little India neighborhood of Singapore. 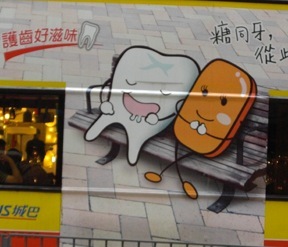 English-language mutilations are easy pickin's in Singapore and HK; in fact whole books of said butcherings have been amassed, usually by sardonic expats snickering at the natives (while they themselves are don't speak a word of Cantonese). Still, some are just too amazing to pass up, and this one merits special recognition. The socks also stand in stark counterpoint to 'Prince Charming', the bling wearing frog that shares the bin. Who would wear 'be alcoholist frog' socks you ask? Perhaps a better question - who wouldn't? 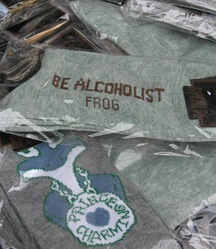 We are exhorted to not only 'wear' alcoholist frog socks, but to 'be alcoholist frogs'...that's heavy.